Ever wanted to go to Oktoberfest but can’t make it all the way to Germany? Well, you are in luck! 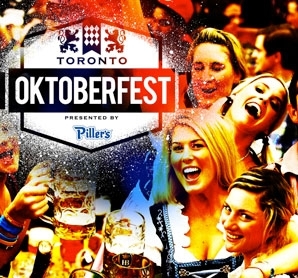 This weekend Toronto is getting it’s very own Oktoberfest complete with polka, bavarian dancing, bratwurst, Fräulein wait service and of course BEER! Toronto Oktoberfest will take place at Kool Haus this Friday September 27th and Saturday September 28th and there are just a few tickets left. Tickets start at $25 or you can get a table for a group of 10 people for $180. The event will have 1L beer steins and a great selection of German beers including Hofbrau, Steigl, Erdinger, Weihenstephaner and many more including some local beers too! There are 4 sessions total, 2 on Friday and two on Saturday. If you buy tickets to the earlier session you are welcome to stick around for the later one too! Tickets can be purchased through the Toronto Oktoberfest website, so don’t delay and get your tickets fast if you want to check it out. I am hoping to swing by on Friday to check it out. To get you started, here is a quick German lesson: Cheers = Prost!